Lions and tigers and bunnies, oh my! 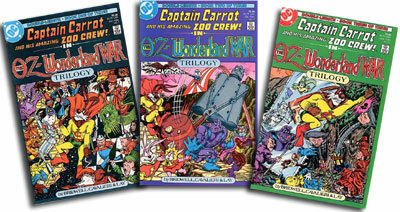 But one of my favorite series of Oz comics of all time is DC's 1986 miniseries, Captain Carrot and His Amazing Zoo Crew! In The Oz-Wonderland War Trilogy. Whew! That's quite a mouthful, so let's just call it The Oz-Wonderland War from now, on shall we? 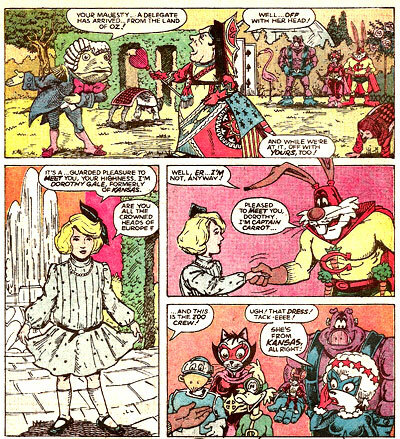 The concept's simple, fast, and fun: it merges characters and plots from Lewis Carroll's Alice's Adventures in Wonderland and L. Frank Baum's first three Oz books (the only ones in the public domain at the time the comic was produced) and mixing in DC's funny animal superheroes Captain Carrot and the Zoo Crew (whose own book had been cancelled a couple years back). 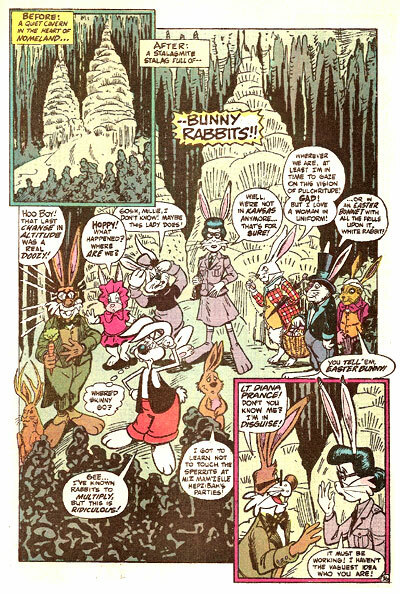 Rodney Rabbit (the mild-mannered cartoonist alter-ego of Captain Carrot) is visited by the Cheshire Cat, who calls for the Zoo Crew's help in defeating the evil Nome King (the villainous underground monarch Baum created in Ozma of Oz). Nomes live in the darkness of caverns and mine precious jewels, and are as tough and ancient as the hills themselves. Their only weakness: eggs are deadly to them. Too bad one of the Zoo Crew isn't a chicken! At a council of war led by Oz's Professor H.M. Wogglebug, T.E. 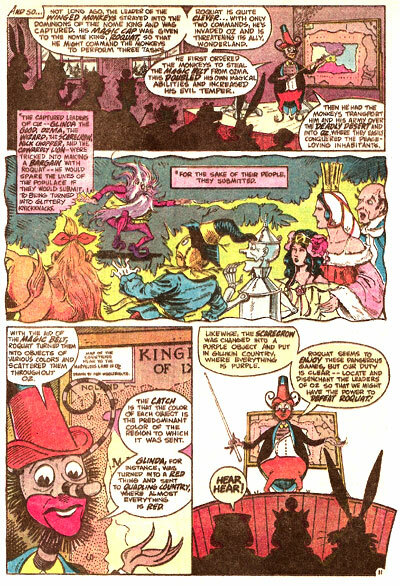 (Highly Magnified, Thoroughly Educated), the Zoo Crew join characters from Wonderland and Oz to plot a strategy against the Nome King, who had kidnapped many of Oz's denizens and turned them into knick-knacks (a plot first used by the Nome King in Ozma of Oz as well). Carol Lay's beautifully detailed artwork is a delight: the Oz characters are portrayed in the same style in which they appear in the classic Oz book illustrations by John R. Neill, and the Wonderland folk are patterned after the artwork of John Tenniel. 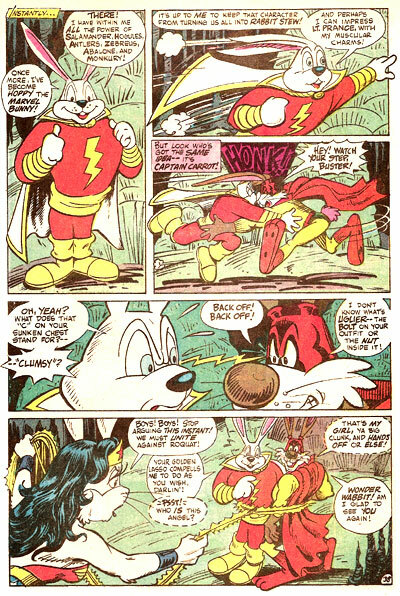 It's a credit to Lay's skill and design sense that not only do the two styles mesh wonderfully, they also work dynamically in the same panels as Captain Carrot and his band of animal heroes. 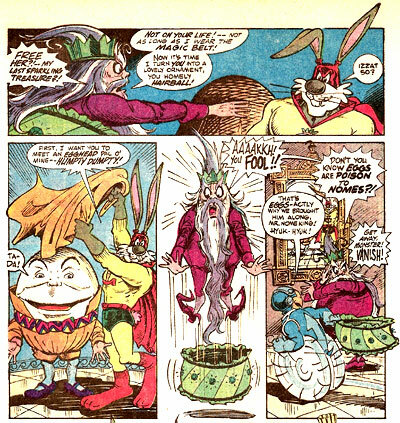 Finally, in the ultimate face-off against the Nome King, all appears to be lost...until Captain Carrot unveils the ultimate weapon of mass destruction: an egg. Wonderland's Humpty Dumpty, to be precise! 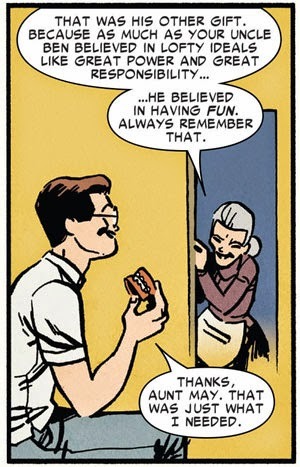 ...which, sadly, never occurred. 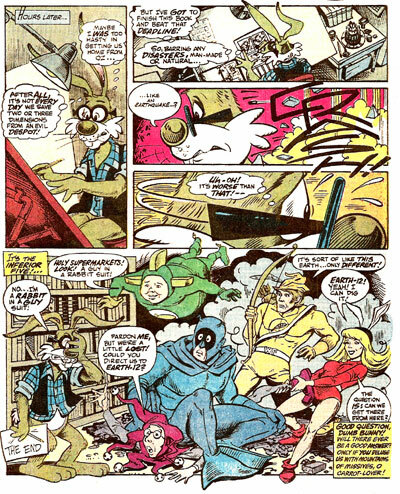 The good Captain and his Crew remained unseen until their recent appearance in Teen Titans and the apocalyptic miniseries The Final Ark, which is a pity. 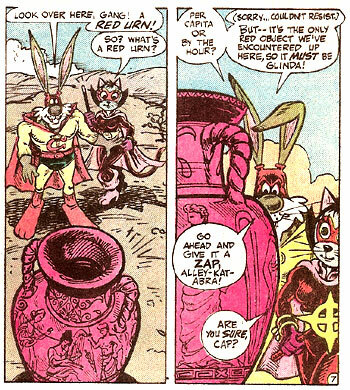 Cap Carrot remains one of the gleefully delightful and satisfyingly silly characters and concepts of the DC Multiverse, and it's a pity a home couldn't' be found for them on at least one of DC's new 52 Earths. (In the meantime, Cap gets to nuzzle up close to Zatanna, and that's not a bad fate as fates go, after all.) 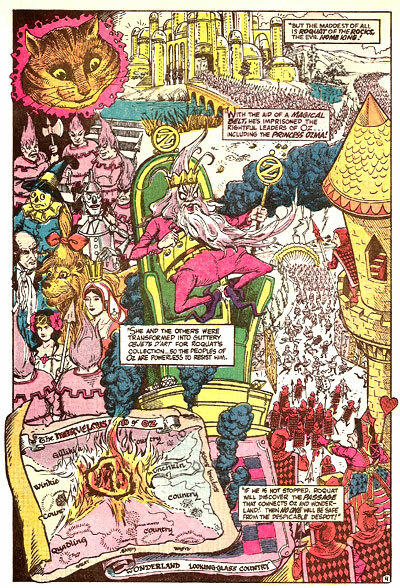 I'm a long-time Oz fan and I'm ever-delighted by comics that don't take their superheroic tropes too seriously, so I've long considered The Oz-Wonderland War to be among The Most Fun Comics Ever. 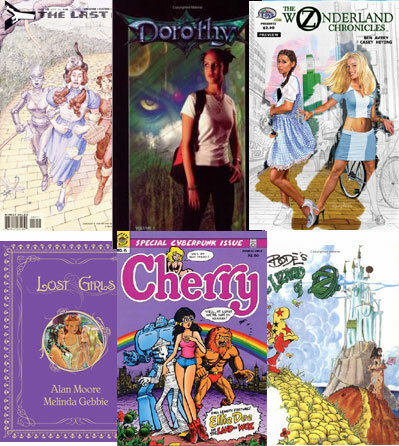 With more kids than ever before reading classic fantasy novels and comics, it's the perfect time to reissue this series in a trade book format. How about it, Johnny DC? 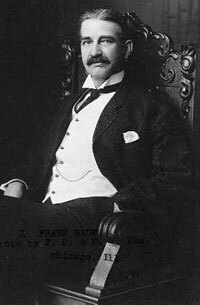 Do us Cap Carrot fans a favor, and salute Mister L. Frank Baum (and Mister Lewis Carroll) at the same time. In the meantime, remember that somewhere over the rainbow, there's a magical land where rabbits, dogs, pigs and turtles fight crime. It's not a place you can get to by a boat or a train. It's not too far, far awayit's waiting for you, in the back issue bins of your local comic book shop. 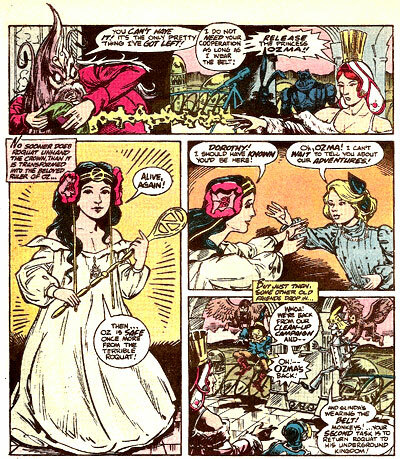 She's absolutely nailed both Tenniel and Neill's styles! 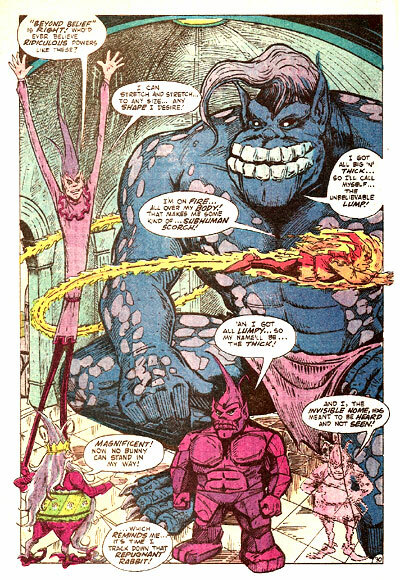 If we're talking about the same illustrator"...my goodness, she's got range! ME WANTY! Thanks Bully! I must now go find these books. I'm with you on this one Bully. 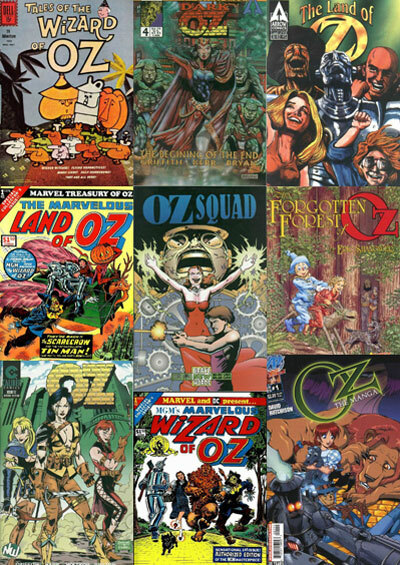 My old Oz-Wonderland comics have gotten a mite yellow. I'd love to see this reissued. 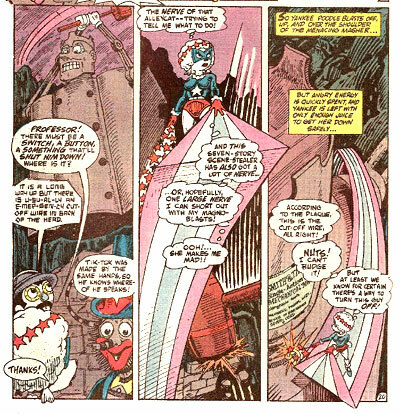 Just as long as Judd Winick doesn't get his hands on Hoppy! Can someone tell me who the talking horse is supposed to be? He was known as Mister Horse and helped Rodney Rabbit get to the Nome King's Lair. The horse later helped Little Cheese secure the magic cap. I assume they couldn't get the rights to the Sawhorse but I don't recall a talking horse in Oz. Feel free to email me at tlyoung at yahoo dot com. Do you mean The Sawhorse, tlyoung? He's a talking sawhorse with a log body and head. 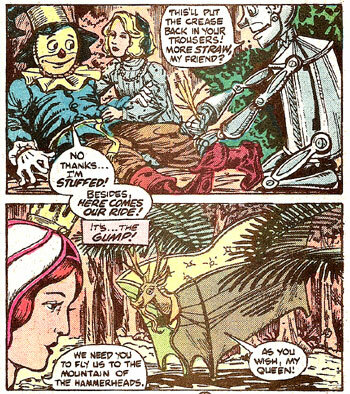 He first appeared in the second Oz book, The Land of Oz, and is frequently seen in the sequels by Baum and the following Royal Historians of Oz.